June 3 Tuesday Still pleasant & warmer Mer 78+ at noon, reaching 80+ in P.M. air still filled with cotton tho' not giving us as much but the yard is white with it now. Feeling so miserable self kept big rocking chair most of A.M. doing very little repairing during the day. Mrs Howe in of errands couple times in A.M. Anna out awhile after supper but back so we both were off to bed early. 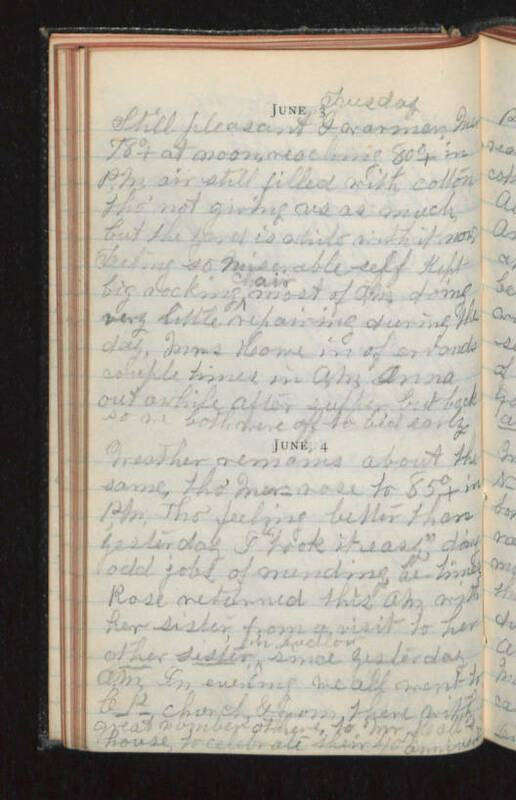 June 4 Weather remains about the same, tho' Mer rose to 85+ in P.M. tho feeling better than yesterday I "took it easy" doing odd jobs of mending (illegible). Rose returned this A.M. with her sister, from a visit to her other sister in (Juction?) since yesterday A.M. In evening we all went to C-P- church & (?) there with great number others, to Mr (Kall's) house to celebrade their 40th anniversary.